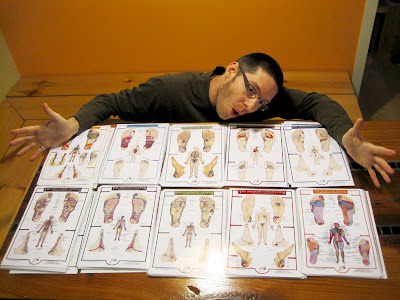 The Reflexology Visual Dictionary Series now has a complete set of reflexology anatomical charts. Being a reflexology instructor I wanted to create an easier understanding of the foot/body connection for my students. I had not seen too many reflexology charts that had all the body parts illustrated right on the feet so, I figured that would be a good place to start. This seemed to be an easy enough task, right? not so easy ... ran into a major problem, which I think a lot of other reflexology charts ran into. The issue: a 2 dimensional chart was trying to express that of a 3 dimensional foot and body. For example the kidneys get buried behind the stomach and liver when you are using the anatomical drawings or pictures. It makes sense to me now why a lot of the reflexology maps out there are simple outlines that are labeled with the organ names rather than a clear drawing or picture of the actual body part. This problem has turned into a blessing because now I have created all the systems of the body in a visual clear way. This project is a lot of work / play and is still growing but now there is a set of charts to show. I have a deep respect for those who are brave enough to tackle a Reflexology chart and for the great variety of Reflexology charts that are out there. If one speaks to you that may just be the right Reflexology Chart for you.